Having been warned we wouldn't be able to get a lunchtime table at 10 Greek Street, we did what we normally do and just walked in. It doesn't always work but more often than not my timing is right and on this occasion it was good enough to score a couple of seats at the bar. For me, it couldn't have been better as I hate to miss anything and, with the chefs right in front of me, nothing escaped my scrutiny. In a good restaurant this can mean you want to eat everything you see, and this proved to be the case here. If you have no sense of restraint, my advice is don't sit at the kitchen bar. Three young chefs and a barman all exuded friendliness and enthusiasm in the small open kitchen. These guys clearly love working together and it shows in the welcoming atmosphere and well-run kitchen. Three front of house staff work the tables but, as we ordered and were served straight over the bar, I can only assume the other diners were as well looked after as we were. I've heard some criticism of noise bouncing around the hard-surfaced dining room but we weren't aware of it. Things started well with a good choice of wines, all by the glass, carafe and bottle. A very reasonable Allegrini Valpolicella at less than £4 a glass (£20 bottle) went so well with our dishes that we stuck with it. A small plate of Fried baby squid with a saffron aioli and simply grilled Sardines with a spoonful of romesco and wedge of lemon were great openers. The freshest of fish cooked perfectly, what could be better? Then came the tender Grilled Poussin, served spatchcocked with Israeli couscous, raisins and almonds. For once the addition of pomegranate seeds made perfect sense. The use of these jewel-like seeds has become so ubiquitous that my heart sinks when I'm presented with a plate 'scattered' with them, but here they actually belonged on the plate. Pancetta wrapped monkfish came on the bone, cooked just right and served with a soupy stew of pale lentils (Italian, I think pepped with a fresh salsa verde. A good Lemon tart could have been great but refrigeration had softened the fine pastry. A great shame as there is a talented pastry chef at work. A light rye bread and a focaccia, made in-house, were delicious. Prices are keen at this plain, 35-seater. They have to be in the heart of Soho where competition is fierce. Small plates and starter-size dishes range from £3 for olives or almonds to £8 for something like Queen scallops and chorizo. Large dishes are priced around £12-18. When we were there a Welsh Black rib-eye with truffle mash and purple sprouting broccoli, at £35 for two, was hard to resist. Having seen it go out of the kitchen, I hope it's on the menu next time I visit. Sides are £3-4 and puds £4-6. 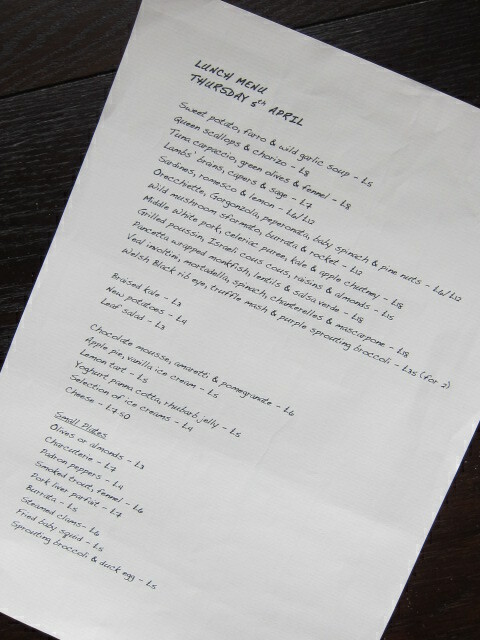 The daily-changing menu is a straightforward description of what will come out of the kitchen. Everything on the plate is necessary to the success of the dish. There is no unnecessary ornamentation. Opened in February this year by Cameron Emirali, formerly head chef of The Wapping Project, and Luke Wilson, ex-Manager of The Ambassador at Exmouth market, 10 Greek Street has quickly attracted an informed following. To my eye, staff dealt with a completely full restaurant with great efficiency and charm. I really should have taken more notice of the wine list but, from other reviews, I gather there is a separate list of finer wines. Like the food prices, all are extremely reasonable. I look forward to getting even better acquainted with both very soon.